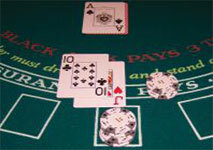 Blackjack is an exciting casino game which impresses with its interesting rules and gameplay. It is possible to find it in almost every brick and mortar casino as well as online. This card game is a skill-based one and as such, it requires more than just luck. In order to be able to win in the long term, you need to be fully acquainted with all of the moves you can make during the game and their pros and cons. One of the options which you have in blackjack is called Insurance. It is a side bet which can be beneficial, however only on the condition that it is made when appropriate. In order to get the most out of it, you need to get familiar with all of the situations in which the insurance bet has proven to be efficient, otherwise you risk losing more money by placing it. Insurance is an optional move which is offered by most casinos, both online and offline. To take insurance means to place a side bet which can be put only if the up card of the dealer is an ace. The main idea of this move is to give players the opportunity to bet that the dealer has blackjack and this way insure their current cards. In order to take advantage of the insurance option, you need to place a side bet that is half of your initial wager. In case that the dealer gets blackjack when his hidden card is revealed, the insurance bet wins and you are paid according to the payout the respective casino offers. It can differ from one place to another, however it is very easy to find it as it is usually displayed on the blackjack table. The standard payout for insurance is 2/1 and for blackjack – 3/2. If the dealer doesn’t get blackjack, your side bet will be lost and the outcome of your hand will be determined as usual by taking into account its total value and the cards of the dealer. Insurance bet is a separate one and as such, it is treated independently. You can make this move after you are dealt your first two cards and before the dealer reveals his hole card. If his up card happens to be an ace, he will directly ask whether any of the participants would like to take insurance. In most casinos, the dealer normally announces “Insurance open” and this is the time in which you are allowed to place this side bet in the designated betting area on the table. It should be noted that this move is available for only a limited period of time as the dealer also announces “Insurance closed”. As already mentioned, you have the chance to take insurance even when you play blackjack online. In such cases, all of the players on the virtual table are asked whether they want to take insurance, starting from the right to the left side of the virtual room. This way, you have the opportunity to either make this move or decline it which makes the game identical to its land-based counterpart. The insurance bet can be a very beneficial one, however only if used in the appropriate situation. In general, it favors the casinos and this is the main reason why so many places offer it. If you are uncertain about the situations in which it is a good idea to place this side bet, you are bound to lose extra money and spend your funds much faster. 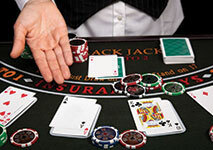 One of the cases in which it is recommended to take insurance is when you have blackjack. The reason why is that blackjack is the best hand you can possibly get in this game and if the dealer also has this winning combination, the result is a tie. Therefore, there is no winner and you don’t get anything in return for having blackjack. If you take insurance in such cases, you will be able to get the same amount of money as your original wager, regardless of the dealer’s cards. In order to achieve this profitable outcome, you are required to take the maximum insurance. The insurance bet has also proven to be very advantageous for card counters as they can determine the ratio of high value cards to low value ones. Keeping track of the cards enables them to get a general idea of the remaining cards in the deck. If the pack is rich in 10’s, then it is a good idea to take insurance as the dealer’s chances of getting blackjack are high enough. In fact, the insurance bet is considered to be one of the biggest benefits for players who know how to apply card counting systems correctly. It is recommended to take insurance when the true count exceeds three. Insurance is a side bet which works in favor of the casino in most cases. Roughly speaking, in case that the dealer’s up card is an ace, it has been calculated that the house edge is around 7.39%, providing that the game is played with six packs of cards. Usually, the dealer will get blackjack around one-third of the time which makes this side bet irrelevant in a number of situations. The aforementioned factors clearly show that if you don’t have a reliable strategy when it comes to taking insurance, you will most likely lose money in the long term by placing this side bet. Since blackjack is a skill-based game, it is essential to be prepared in advance in order to manage to reduce the house edge and prevent yourself from putting any disadvantageous bets. Even though the insurance bet seems like a good opportunity to insure your hand, it has proven to be very risky as it only wins if the dealer has blackjack, which as shown, doesn’t occur that often. The bottom line is that the insurance bet can be beneficial either if you are a proficient card counter or if you have blackjack in your hand. For the rest of the cases, this side bet has proven to work in favor of the casino and in the long term you are bound to lose money by placing it. It is no wonder that the casinos freely advertise that they offer insurance due to the fact that it highly favors them. Thus, it is really important to get familiar with the cases in which it is best to take advantage of this move as otherwise you risk reducing your bankroll significantly for no reason. In general, insurance is said to be a rather disadvantageous bet for novice players who are not fully acquainted with its main usage and subtleties.